Bob Linn has one of the hardest, most complicated, and under-the-radar jobs in city government: he runs the labor relations department and negotiates contracts with the city's many municipal labor unions. 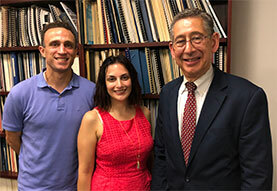 Linn joined the podcast to discuss his career in labor relations, both from the city side and the union side, but mainly his work under Mayor Bill de Blasio negotiating contracts that impact hundreds of thousands of city works and the rest of New Yorkers who rely on those workers and how their contracts impact city finances. I read a lot of stories about the perfidy of teachers. We aren’t perfect. Like in every line of work, some among us do bad things. Often we’re stereotyped for the actions of a few. Despite the frequent and excellent reporting of Sue Edelman in The New York Post, most people don’t know much about administrative malfeasance, however, which exists from school level right up to Tweed Courthouse, home of the Department of Education’s top staff. Let’s say my principal wakes up one morning and decides I’m an awful pain in the neck. In fact, he wouldn’t be wrong. (If he were, I probably wouldn’t be doing my job as a teachers union chapter leader.) While we can get along well under many circumstances, when teachers are in trouble, our relationship turns adversarial. It’s my job to defend our contract, and thereby our members. But it’s not always an easy task. Let’s say my principal claims I threw a cheeseburger at a student. We could meet, and I would tell him I did not, in fact, throw the cheeseburger. There was no cheeseburger and there is no evidence there ever was a cheeseburger. This notwithstanding, the principal could place a letter in my file stating I threw a cheeseburger. He could also state that if there were any more flying cheeseburgers, I’d face further disciplinary action, up to and possibly including termination. Let’s say the principal focuses on something that actually did happen, but has a lot of room for interpretation, like many actions. Perhaps I said good morning to a security guard and the guard did not like the way I looked at him when I did it. The principal could do an investigation (or not) and conclude that I did, in fact, say good morning. The principal could conclude that I looked at the security guard with some negative aspect, or at least the security guard believes I looked at him with a negative aspect. That’s another letter in my file. That’s another threat to my livelihood. Aside from writing a response and attaching it to the letter, there would be nothing I could do about it. You won’t read this in the tabloids, but under our contract, members of the United Federation of Teachers (UFT) are not permitted to grieve, or appeal, letters in their files. It doesn’t matter if they are false, and it doesn’t matter if they are ridiculous beyond belief. The principal decides you are guilty, and that’s pretty much it. If I continue to say “good morning” with that perceived awful look in my eye, it’s entirely possible I could face dismissal. When a principal moves to dismiss a teacher, we go before an arbitrator for a hearing. Granted, it’s unlikely an arbitrator would have me fired for saying “good morning” with a look, whether or not there actually is one. But it’s likely a principal who wrote accusations like that would scrounge for every negative piece of information available. Were the arbitrator to leave me with a job, I’d likely get a fine and be found guilty of something less consequential. In that case, I’d likely be removed from my school and made a part of the Absent Teacher Reserve (ATR). ATR teachers generally rotate between schools covering for absent teachers. Sometimes principals grow very weary of UFT activists. The chapter leader of Central Park East 1, along with a UFT delegate, was removed last year. Both faced charges that were ultimately deemed frivolous. Still, it was only when the entire community rose up, particularly a strong core of parents, that the charges were dismissed. I’m sad to say that activist school community is the exception rather than the rule. I’m sadder to say I know of many other principals who do similar things. Sometimes they are removed and sent off to do who knows what, as was the principal of CPE 1. Just as frequently, they keep their jobs, continue to harrass UFT members and drive morale straight into the toilet. UFT members are permitted to grieve principal letters under certain very specific circumstances. If the occurrence is not reduced to writing within three months, that’s a grievance. This means if it’s June, and I supposedly threw the cheeseburger in September, I can’t get a letter to file about it now. If the school administration fails to meet with the subject of the letter and discuss it before issuing the letter, they aren’t permitted to place said letter in the teacher’s file. Also, if disciplinary charges do not follow, letters are removed after three years. If not, that’s a contractual violation. In our building at Francis Lewis High School, we have outstanding grievances for all of the above. That’s because the Department of Education “legal” division, which I imagine as a bunch of children riding stick horses and shooting cap guns, routinely advises principals to ignore very plain contractual language. At step one in the grievance process, we meet the principal, who informs us legal says whatever he or she is doing, whether or not it violates the contract, is OK. Then, at step two, we go to offices on Gold Street, where a chancellor’s representative presides over a hearing. They have 48 school days to write a decision, which amounts to two or three months, and often they can’t even make that deadline. When chancellor’s representatives meet deadlines, we receive emails. Why wasn’t an incident reduced to writing within 90 days of occurrence, as required by the contract? Chancellor’s reps say things like, ‘this incident is not an occurrence, and therefore did not happen when you say it did.’ They may say an incident did not become an occurrence until the principal found out about it. Time stands still, evidently, before things reach the ears of a principal. I read this stuff and I feel like I’m through the looking glass. Teachers are pretty stressed out under the best of circumstances. Faced with taking a day and going to a Manhattan hearing, some tell me they’re terrified and refuse to go. Others are nervous, but go anyway. I go along to try and reassure them. It’s hard, though, because I now know step two hearings are pretty much rigged and members will have to wait months for a decision, assuming there is one. I have to tell them this is just an exercise, and that we’ll have to wait for step three, arbitration, to get a fair hearing. This process can take over a year. At least five grievances I’ve helped my colleagues write are heading to arbitration. Because these are blatant violations of contract, I expect we will win them all. But here’s the thing—arbitrators work for both the city and the union. They can’t rule one way all the time, or even nearly all the time. Assuming the arbitrators do the right thing and rule in our favor in these cases, what will happen in less obvious ones? If arbitrators try to be balanced, the city will have an edge in many cases. I believe that’s exactly the game the city is playing. It’s a remnant of the teacher-hostile Bloomberg administration, and it’s there because Mayor de Blasio failed to clean house when he came into office. If new schools chancellor Richard Carranza wishes to turn around 16 years of bad faith, 16 years of bad morale, productive for neither teachers nor students, he’ll move quickly to turn this around. He’ll clean house at legal, and demand that all new hires actually read and respect the UFT contract. Arthur Goldstein is an ESL teacher and UFT chapter leader for Francis Lewis High School. On Twitter @TeacherArthurG. The Supreme Court of the United States will shortly rule on the Janus v. AFSCME case. Janus contends that any and all union activity is inherently political, that no one should have to contribute anything to union activity, and that we should therefore become a “right to work” nation. That’s an interesting concept. My union, the United Federation of Teachers, has a political fund called COPE, and I contribute. I frequently disagree with UFT candidate endorsements and decisions, but I believe it’s important to empower our union. Not all of my friends believe that, but contributions to the political fund are strictly voluntary. Union does, however, help press for things like higher pay, better working conditions, and increased benefits. We teachers and our union are frequently criticized for those demands. I see our working conditions as student learning conditions. I see our profession as a pathway to the middle class. At least two of my former students are now my colleagues, something I’m proud of. I think it’s our responsibility to leave our profession better for future generations. Of course, others may disagree with what we strive for. It’s entirely possible there may be a class of teachers who want more work, less pay, and fewer benefits. A ruling for Janus, which would certainly weaken unions, could help achieve that. I’m UFT chapter leader at the largest school in Queens, and I represent Democrats, Republicans, and independents. I’ve never met a single member who wanted more work, less pay, and fewer benefits, but I don’t doubt they may exist. There are over 200,000 UFT members, and I don’t know them all. Nonetheless, I’m fascinated by the concept that Americans ought not to be compelled to contribute toward political activity that, at least in theory, benefits them. If SCOTUS rules for Janus (and smart money says it will), then this “freedom” ought not to be limited to union activity. For example, like many Americans, I don’t want to pay for Donald Trump’s golf outings. Why, then, is my money covering those trips? In fact, I don’t really want to pay for Jared and Ivanka in the White House either. I understand Ivanka may not be taking a salary, but I’m sure she incurs expenses -- an office in the White House can’t be cost-free. Why do I need to pay for the space and upkeep? I’d like to opt out of that as well. It’s entirely conceivable that Donald Trump may start a war to divert attention from the ever-rising tide of scandal that perpetually engulfs him. If he does, I’d rather not pay. If he ever builds that wall, I don’t want to pay for that either. I could go on. I understand that, under the new Trump tax system, New York will be further picking up the tab for states that levy little or no income tax. Why should New Yorkers have to do that? If other states don’t wish to tax their citizens, it shouldn’t be up to us to build their roads or pay for their services. Maybe, like the union members who want more work for less pay, those states have residents who don’t want roads or services. They should have the absolute right to live without them, and we ought not to get in their way. Like a state or country, a union is a group of people who share an interest. Together we try to make things better for our group. We work together to advance our interests, and that’s why we have collective bargaining. I understand that, in a large union and in a democracy, I may not always agree with the direction in which we’re moving, but I have to do my part. And more broadly, I understand, as a citizen, that I have to do my part. I freely acknowledge that our union may not be adequately representing the interests of teachers who want more work for less pay. I can understand that they may wish to opt out of union dues, even if doing so leaves them with more pay in the short run. (Call me cynical, but, if the SCOTUS ruling goes for Janus, I suspect some people who don’t want more work for less pay will also opt out just to save a few bucks.) The fact is that so-called right to work states have lower pay and fewer benefits, and that could become the norm after Janus. However, if union activity is inherently political, so is government activity. If people are permitted to opt out of union dues, we ought to also be able to opt out of taxes. As soon as we can do that, I will consider supporting Janus. But until that happens, everyone who benefits from a union should pay their fair share. 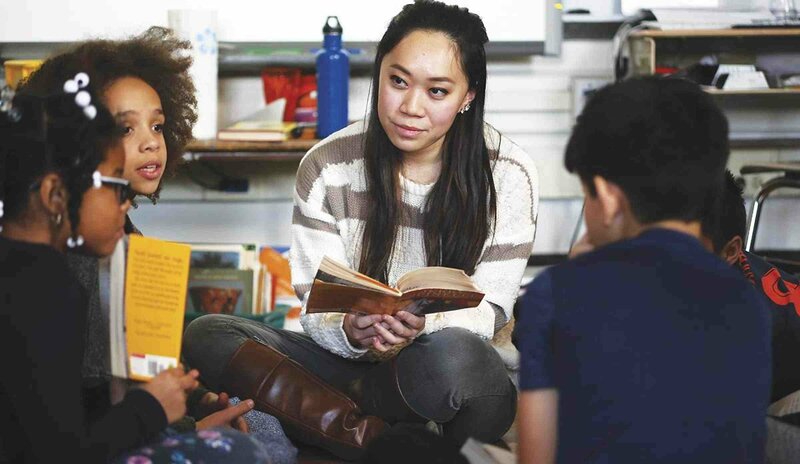 Every work day for the past nine school years, I have taught and learned with young people from stressed economic backgrounds as a New York City public school teacher. Every day, I confront the realities of a system that puts short-term profits over children’s well-being and the long-term health of our city’s families. Scars on students whose parents were unable to take the time to bond with them because of economic pressures. On others whose parents did take time off, but now struggle even more to make ends meet. I see adolescent children fall behind their peers because they have to take on responsibilities at home providing childcare to infant family members so that their parents can rush back to work. Harvard’s Center on the Developing Child confirms what those of us who work with young people know: “responsive relationships early in life are the most important factor in building sturdy brain architecture,” the neurological foundation for all future learning, behavior, and health. When parents do not have time to bond with new young ones in their lives we all suffer. For too long, New York denied the children of all city employees access to the benefits that come from paid family leave for parent-child bonding. Nearly two years ago, Mayor de Blasio publicly recognized the foolishness embedded in this system. He created and imposed on city managers a program that provides up to 12 weeks of paid family leave. But that program penalized many managers with the loss of promised salary and vacation benefits. According to the city’s Independent Budget Office the program was not a cost to the city budget, rather it actually resulted in a savings to the city of close to $6 million. 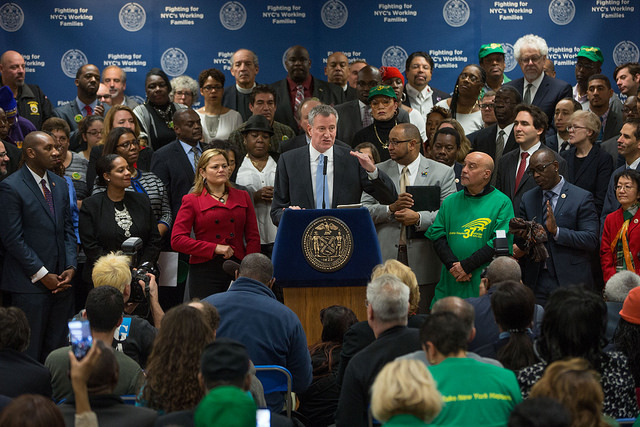 The mayor used his unilateral power to create a system where he got more than he gave up. That is not my understanding of how a “benefit” works. In order to extend paid family leave to members of municipal labor unions, the city and unions must collectively bargain a new agreement. Teachers cannot sign on to the kind of one-sided plan that de Blasio instituted with managerial employees. We know that governments can create family leave without breaking the bank. Cities across the country — including ones in the south and midwest that are not known for progressive social policy — have found ways to fund paid family leave policies for all city employees without going bankrupt. For example, Wake County, North Carolina funds the cost through the city budget. We also know that negotiation means give and take. All of us understand the benefits of parental leave for children and families, but different teachers will have different understandings of the cost side. I’m a chapter leader in the UFT and I would love to have conversations about the appropriate costs of such a plan. We could have these conversations in our chapters and as a union if the mayor’s team would be up front about their calculations and requirements. But the team has provided none of these details publicly. I’m left to wonder if they are trying to accomplish the Mayor’s lofty goals without expending any resources to do so. For 21 months, New York City has formally recognized the importance of paid family leave while accepting a policy that denies this benefit to our city’s educators and their children, as well as many thousands of other union employees and their families. Like a decision that restricts mail delivery for postal service workers, this hypocritical policy denies us what we provide to the rest of the city. The people who care for, educate, and support the young people of New York City should have the chance to care for, educate, and support our own children and families. A good city takes care of the people who take care of it. We do this because it is the right thing to do, the right way to show value for the hard-working folks who make our city run. We also have a self-interest in providing services to city employees — services that make them more effective workers, services that make our city a more appealing place to live. Rather than treating teachers who want family leave like we are asking for a handout, the city should be partnering with us to find ways to support the youngest and most vulnerable of our city’s citizens without sacrificing the work we do. Rather than dragging its feet, the mayor’s team should use the political capital from his re-election to create a family leave policy for all employees. It’s time the administration got behind a real effort to create a parental leave program that works for everyone. John Troutman McCrann is a math teacher at Harvest Collegiate High School in Manhattan. Questions: How do you turn a 25 percent graduation rate into a misleading claim of 100 percent success? When does a school’s 30 percent proficiency rate on an 8th grade reading test translate into the assertion that nearly half of the students passed? Answer: when charter schools do their own accounting, and authorizers allow them to paper over the fact that huge percentages of the children who start in charter schools get driven or eased out. 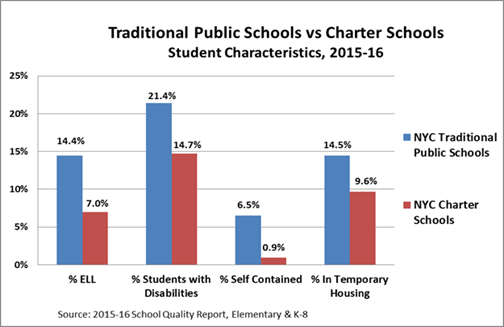 Charters claim that they serve the same children as city public schools, but the truth is that they enroll and keep half the percentage of English Language Learners, dramatically fewer special education students, including those needing the highest level of intervention, and far fewer children who are homeless or in temporary housing. Not content with starting out with more favorable demographics, many charters then rely on student attrition, boosted by draconian discipline strategies, to keep their academic numbers up. 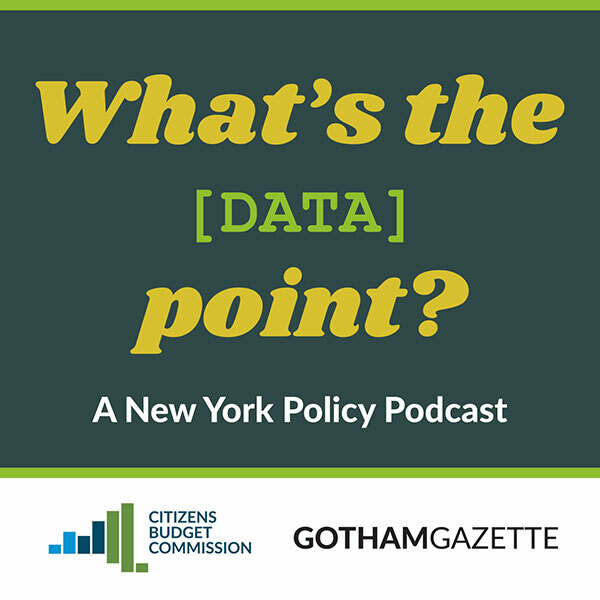 In New York City, charters enroll 8% of the students but account for 45% of the suspensions. Suspensions and pressure on students who struggle academically help charter schools force or ease out students with learning difficulties. And unlike regular public schools, charters often leave empty seats vacant. As one charter organization -- Democracy Builders -- noted, when schools refuse to "backfill" or replace students who leave, the result is charters hyping their results (“artificially inflating perceived performance” in Democracy Builder’s words). 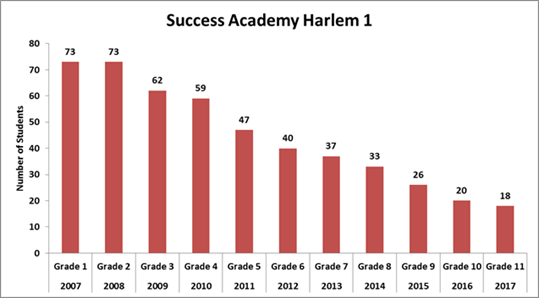 At Success Academy Harlem 1, 73 students began first grade in 2007. By now this class has dwindled to 18 students as they reached the 11th grade. Assuming all 18 stay this year and graduate, Success Academy will no doubt claim a graduation rate of 100 percent. But in fact there are only 18 “survivors” of the original 73; even if all 18 graduate, the school should only take credit for a grad rate of 25 percent of the original cohort. The same logic can be applied to test score claims. Teaching Firms of America Professional Prep Charter School in Brooklyn claims that nearly half -- 47 percent -- of its sixth graders were proficient on the most recent state reading test. But that sixth grade class had only 36 students, far short of the 57 students who were in that class in third grade. So counting the vanished children, only 30 percent of the original cohort actually scored proficient on the 2017 reading test, a rate well below the 40 percent passing rate average for all public schools. None of these facts will stop charter propagandists from repeating misleading claims about their schools’ “success.” But charter authorizers, especially the SUNY Charter Schools Committee, need to be considering these issues as charters come up for re-authorization. 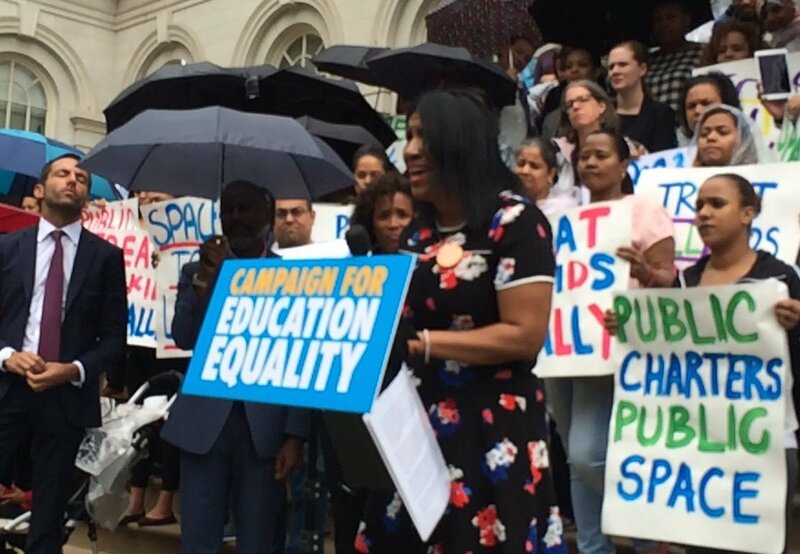 The committee has recently taken a tougher line against some charters, criticizing the chair of the board of Success Academy, Dan Loeb, for his indefensible statements comparing the actions of State Senator Andrea Stewart-Cousins and teachers unions with the KKK. But the committee's recent proposal -- to permit some charter schools to drastically reduce the amount of preparation teachers must undergo in order to be certified – is an ill-considered favor for a sector that has proven itself not only incapable of honest accounting, but also unable to retain a qualified workforce. If charter schools are to perform their original mission -- to act as laboratories of innovation -- it is up to authorizers to ensure that charter schools take seriously their obligation to educate all kinds of children, and to give New York parents a realistic view of both their successes and their failures. Michael Mulgrew is the President of the United Federation of Teachers. On Twitter @UFT. Note: this opinion column has been corrected to reflect that one organization cited is Democracy Builders, not Democracy Prep as originally stated. Children who miss 20 or more days of school in New York City have lost so much instruction time that they are classified as chronically absent, which studies have linked to lower test scores and higher dropout rates. So it is hard to see the educational purpose behind Success Academy's suspending a special-needs 7-year-old for 45 days, even if some form of alternative instruction was provided. This one recent example is part of a much larger pattern, both for Success Academy and the larger charter school sector it is the leader of. Sadly, Success Academy is far from the outlier in the charter sector in the use of suspensions as a punitive tool. A 2016 study by the Center for Civil Rights Remedies at the University of California, Los Angeles, found charters nationwide suspended African-American and special-needs students at a disproportionately higher rate than their white or non-disabled classmates. The report was the first national review of charter school discipline. In New York City, although the charter school student population was less than 7 percent of the system's total enrollment, charter schools accounted for nearly 42 percent of all suspensions, according to a review by The Atlantic of 2014 state suspension data. Charter schools accounted for 48 of the top 50 New York City schools with the highest suspension rates for the same year. The Icahn Charter #7 in the Bronx reported giving out 142 suspensions to its 99 students that year, the highest suspension rate in the city. Achievement First Crown Heights Charter reported issuing 200 suspensions to its roughly 940 students that same year. Teachers know that there is a place for suspension of children who are dangerous to themselves or others, or who constantly make learning impossible for their classmates. 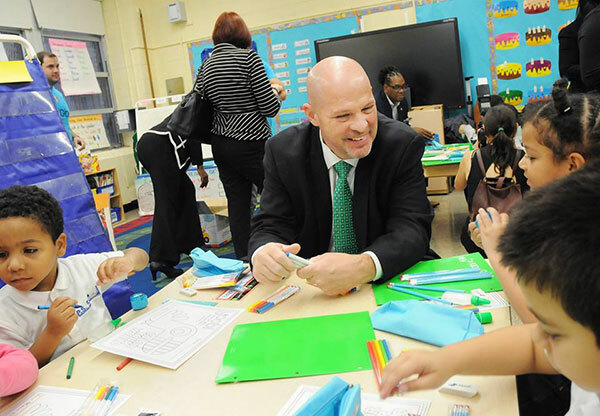 The UFT fought to ensure that the system's new discipline policy included the ability for a principal to suspend even the youngest children, though the potential loss of learning time means that suspension should always be a last resort. But we also know that it takes time, energy, and public scrutiny to move from punitive, after-the-fact discipline codes to pro-active, restorative practices that can change school climate. At the UFT, we have joined with the city Department of Education to create a package of training and techniques to help staff identify and deal with issues proactively, known as the Positive Learning Collaborative. At schools enrolled for three years in this joint venture, suspensions are down, as are the kinds of incidents that used to trigger them. And perhaps more important, the satisfaction of children, staff, and parents in the schools is up. Charters need to do similar work, and do it publicly to regain the trust of the public, particularly parents and students. Michael Mulgrew is president of the United Federation of Teachers. On Twitter @UFT. But despite these available funds, New York's charter chains are lobbying for more public support in the form of increased tuition reimbursements, additional rent subsidies, and the elimination of the cap on the number of charters – all of which would siphon off public funds that could go to the state’s traditional public schools. Michael Mulgrew is President of the United Federation of Teachers (UFT). On Twitter @UFT. In 2009, then rank-and-file Assembly Member Carl Heastie was the lead sponsor of a bill designed to weaken then Mayor Michael Bloomberg’s ability to determine education policy in New York City. Seven years later, Assembly Speaker Heastie is thought to be Mayor Bill de Blasio’s greatest ally in the fight to renew the system of mayoral control of city schools as is. The 2009 bill, called the Better Schools Act, would have removed the mayor’s ability to name the majority of members of the Panel For Educational Policy, allowed the city’s Independent Budget Office to audit "financial investments and academic achievement," and provided training for parents and teachers to be more involved in the system. The bill never came to a vote in the Assembly as then Speaker Sheldon Silver was a supporter of mayoral control. The bill died in the education committee two years in a row. It did, however, get a vote in the Senate in July 2009 where it was voted down. Bloomberg, in 2002 the first mayor given mayoral control of schools, won a six-year extension. That extension came due mid-way through de Blasio’s second year in office last year and the mayor was given just one year more as his ongoing conflicts with Senate Republicans, who control that chamber, and Gov. Andrew Cuomo, dominated policy-making in a turbulent Albany rocked by scandal. Both Senate Republicans and Gov. Cuomo disagree with de Blasio on several aspects of education policy, like support for charter schools, while also having major political problems with the mayor. Cuomo has proposed a three-year extension and stayed out of the public discussion, but the dynamics between de Blasio and Senate Republicans appear to have killed any chance at a nuanced debate as an extension is again being considered and de Blasio was asked to participate in two May hearings on mayoral control of the schools. He attended the first, in Albany, and sat for four hours of testimony, but declined to appear at the second, in New York City, letting his schools chancellor, Carmen Fariña appear. Senate Republicans, especially Majority Leader John Flanagan, were not happy. The irony, which applies to many involved in this education debate, is that de Blasio’s belief in the concentrated system of power that mayoral control provides more closely aligns with his biggest critics, while de Blasio’s allies are forced to support a system they largely criticized under Bloomberg. 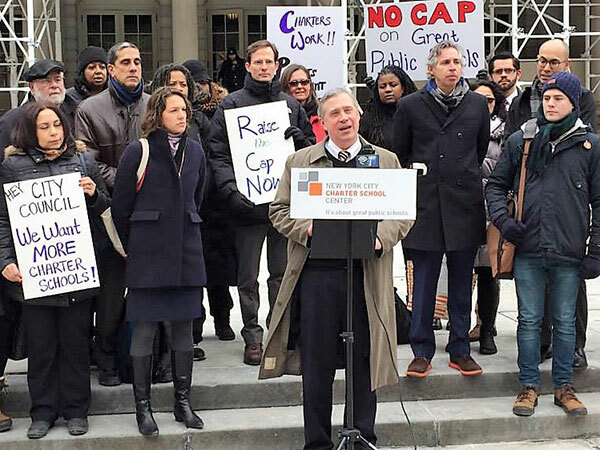 Education reform groups, largely funded by major donors to Senate Republicans, have staged protests of de Blasio’s policies, but continue to support mayoral control as a governing system. The city’s teachers union, the United Federation of Teachers (UFT), was often at odds with Bloomberg and is very close with de Blasio, but has not been a vocal supporter of mayoral control. The UFT and Senate Republicans are often antagonists and the union declined to testify at either hearing this month. Heastie’s office did not return request for comment on his past support of the bill and whether he would be interested in voting on a bill that alters the current school governance system. A spokesperson for Senate Republicans declined to comment on Heastie’s support and whether Flanagan is considering changes to mayoral control. Flanagan has been critical of de Blasio on a number of fronts, including in a statement after the mayor’s Albany testimony in which Flanagan said de Blasio had not answered questions to his satisfaction. 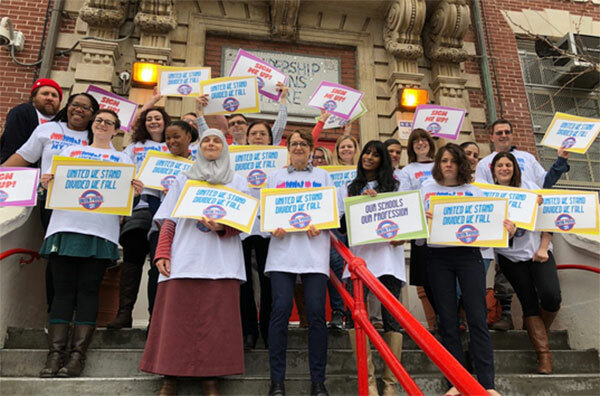 The Better Schools Act would have expanded the PEP from 13 to 17 members serving two-year terms, with the mayor appointing eight members, each borough president one, one by the City Council, one by the Governor, and one by each head of the Assembly and Senate majorities. Now, the panel’s 13 members include eight appointed by the mayor and one each by the five borough presidents. “Bloomberg had gravitas and immense wealth; de Blasio has neither,” said Doug Muzzio, professor of political science at Baruch College, when asked what he saw as the major difference between the 2009 and 2016 battles for extending mayoral control. In 2009 Senate Republicans were Bloomberg’s greatest ally. The mayor was seen by many as the conference’s financier, but for the first time in decades they were technically no longer in control of the chamber. That is until then Senator Dean Skelos teamed with rogue Democratic Senators Pedro Espada and Hiram Monserrate to stage a coup, suddenly casting a leadership vote that other Democrats protested. The following legal and political battles saw the chamber sit empty for months. State government was crippled and mayoral control expired. Technically, the system reverted back to the old Board of Educaiton set-up with more decentralized power, something many have called inefficient, ineffective, and rife with nepotism and corruption. When Democrats regained control of the chamber in 2009 then Senate Democratic Leader John Sampson insisted on making a number of changes to mayoral control to increase parental involvement, angering Bloomberg. Sampson and other Democrats continued to hold a grudge against Bloomberg for his generous financial support of Senate Republicans. Despite their general support for Bloomberg, a number of city-based Republicans at the time also advocated changes to increase parental participation in education decision making. Some of the major players against mayoral control included Sampson, Espada and Senators Carl Kruger and Shirley Huntley. All of them have since been convicted on corruption charges (as has Skelos). Eventually Bloomberg abandoned negotiating with Senate Democrats and invoked Neville Chamberlain in a an interview. Senate Democrats were outraged saying Bloomberg had compared them to Nazis. Asked by a reporter whether he meant to compare Democratic state senators to Nazis, Bloomberg replied: “I certainly did. What part of that did they not understand? This is ridiculous." The mayor’s team later walked things back, saying he hadn’t heard the question. The New York Post, meanwhile, ran a month-long series of pieces highlighting the benefits of mayoral control, titled “City Schools, City Rules.” The Post later celebrated its own coverage, running an August 2009 story with collected quotes from public officials, including Bloomberg, praising its reporting on the subject and taking some credit for the deal that was reached. Post front pages that spring had been unsparing, salacious attacks on the dysfunction in Albany - the paper even sent a clown and had her pose for pictures with legislators. Those pictures later became even more salacious covers. The deal that was struck gave Bloomberg a six-year extension, but included new checks and balances: the IBO with more oversight over education spending, required hearings over the potential closure of underperforming schools, and Panel for Education Policy approval of Department of Education contracts worth more than $1 million. Last year, as mayoral control was heading toward sunset, the Legislature was rocked by the indictments of its legislative leaders - Silver and Skelos. The Legislature was finding its footing under the new leadership of Assembly Speaker Heastie and Senate Majority Leader Flanagan as the mayoral control deadline approached. Bloomberg was no longer mayor, his large donations to Senate Republicans had ceased. Heastie, a Bronx Democrat, and de Blasio were developing a strong alliance. De Blasio not only wasn’t donating to Republican candidates - quite the opposite - he was finding creative ways to donate to swing-district Democratic candidates in their bids to unseat Republicans and win back control of the chamber. Flanagan balked at proposals to renew mayoral control by the six years it been extended under Bloomberg or even the three proposed by Gov. Cuomo and others. De Blasio was calling for it to be made permanent. When the legislative session’s “big ugly” hodgepodge of legislation was unveiled, de Blasio was left with a somewhat shocking one-year extension. The mayor knew Senate Republicans were behind the minimal renewal, but he also blamed Cuomo for not going to bat for him - part of why de Blasio unleashed a very public tirade against Cuomo on June 30. 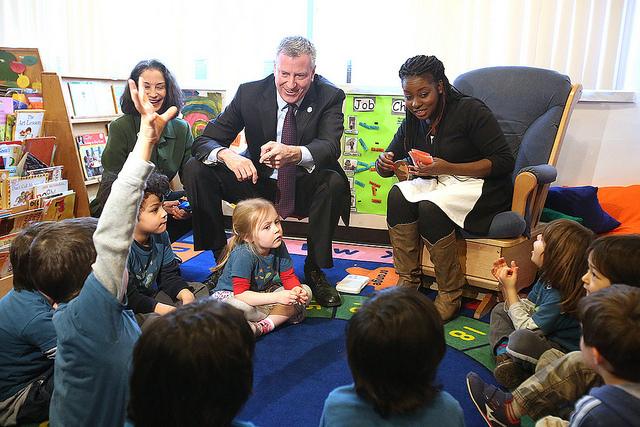 This year, de Blasio’s position is even weaker and Albany only slightly less chaotic. The year started with the convictions of both Skelos and Silver and then news of federal investigations into de Blasio’s fund-raising and Cuomo’s economic development programs. Senate Republicans are now on edge as they lost the seat Skelos held for decades to Democrat Todd Kaminsky and they face the prospects of a number of aging and retiring members. But the de Blasio scandal has given them hope as the probe into his 2014 fundraising for those state Senate races has led investigators to a number of districts with races that could determine control of the chamber. Democrats are sure to continue to dominate the Assembly. Carl Heastie remains de Blasio’s most important Albany ally. De Blasio then decided not to testify at the second hearing last week, further angering Flanagan. "I am extremely disappointed the Mayor doesn't believe this hearing is significant enough to attend," he said. "With the future of mayoral control at stake, Mayor de Blasio has left too many unanswered questions about his stewardship of the New York City school system." 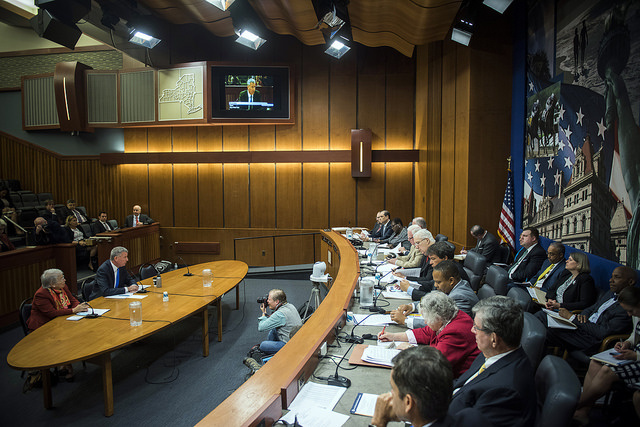 During both hearings this year, Democratic Senators have repeatedly mentioned that they favor renewing mayoral control for de Blasio but are concerned about how another mayor might run the system. The issues of oversight and parental involvement have been raised yet again by people on both sides of the aisle. De Blasio and many others - including the 100-plus business leaders who announced their endorsement of an immediate extension - have argued that the discussion is not about a particular mayor’s policies, but about the mayoral control system as a governance structure.